This list shows some of the top trends for custom kitchens for 2019 which will help you change the outlook of your kitchen completely. A lot of new technology has made its way into the kitchen space. Many functions and appliances are integrated starting from kitchen cabinets to a refrigerator, which make tasks simpler and quicker. This has given rise to smart kitchens in homes in cities like Vaughan. Designs of smart kitchens are evolving every single day and many things are being modified from the ground up. Older kitchens are being revamped using sensors and smart gadgets as per homemaker’s desire. Motion sensing enabled kitchen faucets can detect the presence of hands underneath. Smart refrigerators can check and display groceries items which are running low. Coffee makers are programmed to prepare coffee as per your wake-up time. Gadgets which can monitor the condition of the eggs can be quite useful as well. 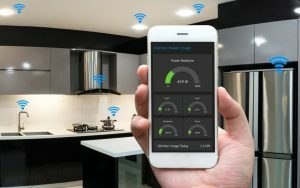 A smart lighting system which can be controlled by a smartphone or tablet can save a lot of energy. Experimenting with smart kitchen technologies has become one of the biggest trends in 2018. White custom kitchens are still a big favorite for many homeowners. These white cabinets add a clean and beautiful look to the kitchen. They are timeless and are suitable for any kitchen style. Other than white, which will continue to be popular in the future among homemakers in a city like Vaughan, people prefer light colored paints or wood stain colors. Mixing of finishes can create some unique outlook too. Gray is the second choice for many folks just after white. Gray custom kitchens look amazing with some natural elements or glamour accents. White and gray are always popular as kitchen cabinet colors. To the other extreme end of the color palette, dark jewel tones such as black, navy, emerald green and plum look elegant for custom kitchens. Dark kitchen cabinets enhance a kitchen space due to its luxurious feel and subtle dramatic essence. 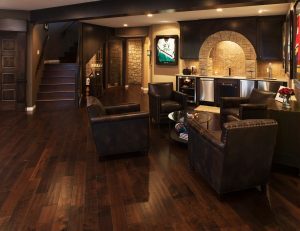 But, too much dark color can make the room feel perpetually dark. 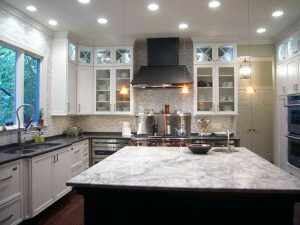 But the number of homeowners in cities like Vaughan opting for dark custom kitchen cabinet colors is increasing steadily. 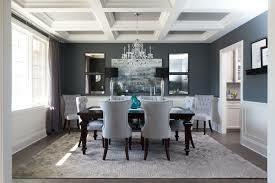 Unlike white and gray colors, dark colors will get more popular with time. More and more homeowners prefer streamlined designs for overall aesthetic and styles like the farmhouse and mid-century modern. People prefer simplicity. To make the kitchen appear much larger and brighter, people are removing upper wall cabinets. Most people can’t reach the top shelves of the kitchen cabinets and removing them helps in making the countertop space more productive. Rough cut wood brings in natural elements or metal tubing gives and industrial outlook. Ceilings with coffered, tray and wood beams look great too. Quartz is still preferred for high-end kitchen countertops. It is extremely durable, last forever, easy to maintain and is anti-microbial. The main competitor is Granite which requires slightly more maintenance. Thanks to technology, a wide range of colors for quartz countertops is available to choose from. Quartz finishes with exotic swirls and large veining are available to look like materials like natural stone. These unique styles have become immensely popular. The trend is shifting towards more neutral colors. Homeowners in cities like Vaughan are opting for color finishes such as gray, taupe, creamy or white. The latest trend also shows the rising popularity of composite sinks made from the same material as the countertop. This creates a cleaner and uniform look and maintenance becomes easier. Although stainless steel and farmhouse sinks are still popular. To overcome any storage-related challenges, homeowners in cities like Vaughan are trying to optimize the custom kitchen cabinet space. Tweaks like appliance garages, drawer dividers, pullouts for spices, tray dividers, as well as wastebasket cabinets are being used. These help in storing foods, drinks and small appliances easily. 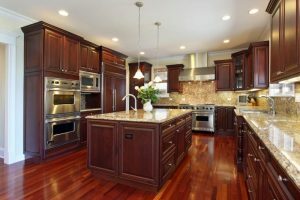 Hardwood flooring is preferred by lots of homeowners just like wood finish custom kitchen. But ceramic flooring which comes in a wide variety of designs and styles are getting a lot of attention. Ceramic tiles can be designed to look like hardwood flooring or have a natural stone finish. Kitchen islands have become focal points and the hub of the kitchen. The primary purpose of a kitchen island is to have storage cabinets and to provide seating for casual dining or drinking. Baby proofing the kitchen is very important. Latest trends show that a lot of ideas are emerging for a pet-friendly kitchen. One solution is to get a feeding station, which is usually at the end of a kitchen cabinet or in the corner where you can store pet food. A kitchen island with a custom-made doggy bed underneath the countertop is another great idea. On account of the issues with size, bathrooms have become one of the most difficult places to renovate. Since there is a considerable amount of functionality and time a person spends in the bathroom, it makes it a necessity to remodel a bathroom. 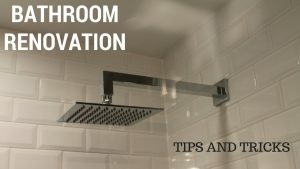 Going by the statements of bathroom renovations, there are a number of tips when it comes to remodelling a bathroom. With these tips, one can remodel a bathroom from a simple bathroom quarter into a relaxing spa. Be it looking for options in order to change a small bathroom in an office space or when it comes to the look change needed for the homeowner, these tips will apply. With the perfect lighting setup for a bathroom, one can change the entire look of it. Bathroom repair Toronto always suggest that in case the bathroom has windows in it, then the best thing is to leave it free and not cover it. To increase the inflow of natural light there is the option to add a skylight to the bathroom space. Combining good lighting with effort will help in making the bathroom look larger. To get an even glow there is the option to set up vanity mirrors on both sides with the help of scones. To go for some creative designing and a better lighting, the overhead fixture can be skipped. Instead of that pendant lamp can be chosen. Many people look for the option of storage in a bathroom. This is mainly true when it comes to the requirement of space for keeping all the necessary things in place. Bathroom repair Toronto say that many people look for optimum storage for things such as washcloths, shampoo, towels, soap etc to be kept in an ideal way. There are lots of ways this can be done just like going for built-in-shelves. One other option is to go for floating shelves. They will help in boosting up the style of the bathroom also giving the illusion that the bathroom size is larger than it already is. To make the bathroom look more creative one can go for brighter light options. Many get confused on whether to go with bright color options or not when it comes to bathroom choices. This is because many bathrooms are small in size. 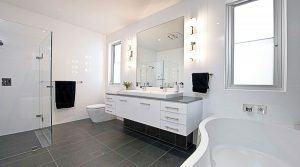 According to Bathroom repair Toronto experts, they say that both color choices are in demand. Some go for a soft neutral color and there are others who want to go for brighter attractive colors to give a more unique look to their bathroom. The brighter options are preferred when people want to make their small bathroom space look less cramped. One good thing about a tiny bathroom is that even though space is small one can add in a lot of additional features with the available monetary situation and make the bathroom look classy. Accessories which won’t cost much can be used to make the bathroom look attractive. Most of the people around the world learn about plumbing through trial and error method. No one will be able to maintain all the aspects of the home and maintain everything perfectly. It is a good thing that you will now be able to hire people who you can trust blindly to do maintenance work at your home. 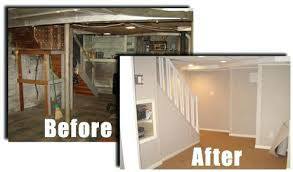 There are things which you have no idea how to maintain in your place so you can simply hire a person who is expert in that field and they will come to your house and fix all the problems that you are facing. There are a lot of videos on the internet which will help you learn how to fix problems but sometimes calling an expert is much better because it helps to save a lot of energy and time. 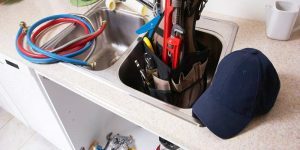 If you want to hire a person you are an expert in plumbing, then there are a few things that you need to keep in mind so that the next time you need a drain repair you can simply call an expert. Basically, plumbing is of two types. One is drain cleaning and the second one is plumbing. Plumbers know how to clean drains but the thing is they are not an expert when it comes to cleaning drains. There are plumbers who don’t clean drains because they do not like doing it. Drain repair experts are generally specialized in clogs and sewers and they have a very little idea about any kind of plumbing. All the plumbers need to have a license to work. Plumbers need to have advanced level training and permits so that they are able to work. Plumbers need to specialize in an area or multiple areas to start working as a plumber. Plumbers generally charge an hourly basis. According to the website indeed plumbers from the area of Denver charge about $23.29 per hour. None of the people working as drain repair clears need any kind of permit or license to work. All the people working in drain cleaning need to have an advanced level training to be able to work in this industry. These people do not do any kind of repair work or any kind of plumbing work. They are only responsible to clean drains and sewers. The pay scale of these people is also in hourly basis but they are paid less per hour as compared to the plumbers. When it comes to sewer inspection a plumber as well as a cleaning technician will be able to inspect the sewer. Both of the professionals are trained in such a way that they are able to inspect drains. It is very much important to have a proper level of training in all these types of work. 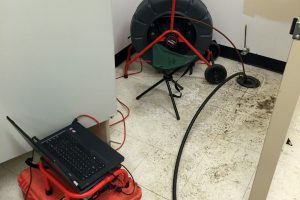 There are people all around the world who are trained in both the work and are working both as plumbers as well as drain cleaners at the same time. For more info, read here! Painting a room or a house is the best and affordable way to convert a room, enumerating logic of space & depth where it is required. But, the important thing is how do you pick the colors? It is a fact that when you walk through the aisles of Toronto painting, you can get overwhelmed by seeing so many colors and definitely it is not an easy task when it comes to choosing the perfect color for your room. Here you can find some of the best tips that can help you take a right decision and right color for your home. Take a look at the amount of natural light you get in the room. Accordingly, choose the right shade, if you select the dark shade for the striking wall, but if the room does not get natural light, then the room will look depressing and grim. So before selecting the color for the room, check how much natural light you get in the room/space. True, the eye-popping colors look amazing in the magazine, and it sure to attract you, but, you should consider the room size before choose the bright color paints. If space is not large enough, then bright shades can easily overpower and may cause visual conflicts. The best thing you can do to make your room glossy is by using cushions with vibrant hues or you can paint flamboyant accents inside the cupboards and on woodwork. 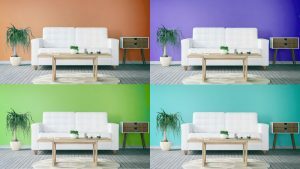 Take a picture of the room that you want to paint, and then upload it into Photoshop and paint different colors to the wall. Also, you can ask your close friends and family opinion before choosing the color for your room. Now, to make your job easy, there are several apps available online that you can easily download on your Smartphone or PC. The apps such as Color 911, Dulux Color, or Resene Color Match allows you to find the right color and right shade of Toronto painting that looks perfect on the walls. Once you find the right color, and then measure the room to find how many meters the tin will cover so that you can place the order idyllically. It is always advisable not to depend on sample swatches to choose the color, it is better to test the color directly on the wall so that you will know how it looks on the wall. Leave the Toronto painting on the wall for a couple of days and check how the natural light changes it or creates shadows at a different time. For instance, black paint changes into different shades in certain lights from blue to green to grey. Also, colors on the wall come out a bit darker than they appear on the swatches, in case, you are looking for a lighter shade, then you can change the color immediately. Also, it is advisable not to go with your color memory as it can play tricks on you. So, it is always best to check the references before choosing the right color paints for your home.